Share your favorite famous horse names! 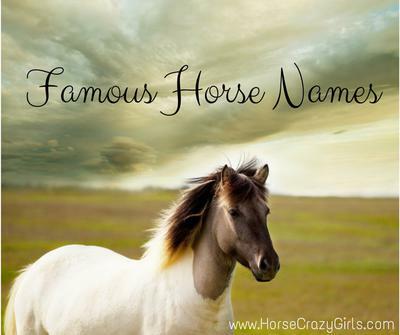 Here you'll find famous horse names shared by other horsecrazygirls like you! Feel free to comment on any of these names or share your favorite famous horse names here. I chose this name because it makes me think of a wild untamed stallion and On the TV show Texas Ranger, Chuck Norris rode a wild stallion by the name of Santana. I chose this name because it is really interesting. It comes from ancient Greece. My favorite horse name is Odyssey because it is very different and sounds so beautiful. It is the perfect name for a beautiful graceful horse. Not only does it sound beautiful but it reminds me of a strong horse. It would make my day to own or ride a horse named Odyssey. I think it is the perfect name for almost any horse. I think it's a very graceful name for a horse. It is a name that can describe a horse or remind people that horses have spirit in them no matter what and it won't go away. It's a classic name. I used to lease a horse named Flicka and she was the best thing ever. My horse is a French Thoroughbred and Armani is just a cool name that happens to be a French designer. It was a Greek king's favorite horse. Bucephalus was his fastest, strongest, and bravest horse. He named a city after him - the great, old city of Bucephalus. I want a young black Arabian mare so I don't see her die and I also always wanted an Appaloosa. I love the color black that's why I like black beauty for a horse name. He was a little horse and he made a big name for himself! Stormy is the name of Misty's foal in Misty of Chincoteague. Another famous horse name is king of the wind. I read that book and I am pretty sure there is a movie. I really want to watch it. Snowman is such a cute name. The story about Snowman the show jumping horse is also really touching. Black Beauty is a classic and very famous name, perfect for a black horse, it comes from the book by Anna Sewell. Its really nice. A good horse name is Brownie especially if you have a brown horse like me. Tucker is my favorite horse name because you can name your horse any thing you want to because it is your horse. My mom named her horse Molly. If anything, a good name to call your horse is secret because it will keep all your secrets and is the best listener but my horses names are Buttercup,Sandy, Bullet,Red, Luna, Angel, Spirit, Midnight, Oreo, Molkie, Stella which means star, Faith. But I should be getting a new horse soon and I need suggestions for its name. I love the name Easy because it's different name. You never think about it. I used to have a horse named Easy and his name described him so well! I like this name for a barrel horse or any other fast moving horse and I think it would fit a boy more then a female. Here is a list of all the horses who won the Triple Crown and the year they won! Myth, Literature, Mr.Famous, Spice, Herb, Sassafrass, Soda, Fire Ember, Vega, Lyra, Butterfly, Triton, Mischief, Sweetheart, Apostle, Mica, Mocha, Daffodil, Storm, Tundra, Blizzard, Snowy, Panther, Coal Black, Blackout, Donut, Hershey, Copper, Shasta, Shade, Shadow, Moonlight, Eggnog, Peppermint, Pistachio, Hazel, Hazelnut, Pecan, Peanut, Almond, Coconut, Cashew, Cupcake, Brownie, Cake, Oreo, Milkshake, Malt, Ice Cream, Biscuit, Ebony, Citrus, Domino, River, Sandy, Cinnamon, Asia, Milky Way, Jay, Violet, Victory. Alexandra, Lily, May Flower, Pilgrim, Moonlight Dancer, Native, Sassafras, Topaz, Gemstone, Jupiter, Chester, Coal Black, Larkspur, Starlight, Lead By Example, Spark, Sparkle, Tundra, Blizzard, Constellation, Czar, Golden Starlight and Mistletoe. I love horses and I'm getting one next year. I'd like to call it Secret if it is a stallion or gelding. If it's a mare, I'd call it Flicka. Liberty, because it sounds so free! Sundancer and Diablo! Blackshadow or Secretariat. Blackshadow is just a name I came up with because to me it means power. Secretariat is a famous race horse who won in the Belmont by 31 lengths. I have read this name in one of my horse books. It sounds sooooo dreamy and it's for a white horse with grey spots!!! Sambo, Faith, Dottie, Hope, Leroy, Simon, Lacy, Shadow, Eclipse, Kelso, Lucky, Nelly, Bella, Charlie Chaplin, Lightning, Rosie, Izzy, Colorado, Coal, Beauty, Selina, Athena, Pearl, Houdini, Lolo, Jim, Big Ben, Foxfire, Lakota, Patches, Freckles, Cookie, Dakota, Dragon, Star, Naiomi, Bonfire, Arrow, Annie, Prince. Those are just a couple of my horses, I have 85. Schleich horses of course. This horse mentioned above - was Alexander The Greats Horse - he was a polydactyly horse, meaning several digits on one hoof. There was another famous King that rode a polydactyly horse as well. Interesting how he was named though. I got a Connemara X Welsh horse for my birthday. Its name is Patrick and I absolutely don't like that name! I want an awesome name for it! It's grey and has a long white tail. He is a jumper and a dressage horse. I like the name Sham. Sham was the name of the horse in the book, King of the Wind. I love that story. Plus, this name is short and rolls off your tongue. Need good stallion names for a Connemara with a liver chestnut coat. Help please! I don't own a horse but I wish I do! I have a cat named Edelweiss (from "Sound of Music") and I love that name. I like Cherish because it means deeply loved. I also like names of birds like Blue Bird, Chickadee, and Falcon. Spirit, Thowra, Storm, Twister, Jet, Stardust, Moondust, Moonlight, Zelda, Legend, Ghost, Majestic, Goodna, Kalari, Koda, Champ, Red, Balto, Bolt, Bonita, Esperanza, Yuri, Misty, and Secretariat. Vanilla is a good name too! My best friend just got a horse and looks exactly like Joey from the movie Warhorse, she was wondering if she should name her horse after Joey from Warhorse. I just wanted to give her the right answer! Any opinions?! Thanks! If she likes it sure! I think those are really good horse i like them both. How about a horse named Buttercup or Isabella? I love the name Shutterfly. I was watching a show on TV and one of the horses was called shutterfly! LUV IT!!! Simply hot is my fave cause my cousin used to own him and he sure is pretty! Red Rum is a famous racehorse. He was foaled in 1965 and won the grand nationals in 1973, 1974 and 1977! He died in 1995. He has a special grave near the winning post in Aintree. Pretty and big and not willing to back down. Zeus, Poseidon, Hades, Aphrodite, Athena, Demeter, Apollo, Artemis, Hestia, Hermes, Ares, Hephaestus, Hera, Pan, Dionysus, Kronos, Helios. There are MANY more but those are the main ones. Frankel is the fastest race horse alive right now. I think it's a cute name for a bay (male). Also for a mare, a good name could be Black Caviar who is also an unbeaten mare racehorse at this time. My lesson trainer is buying me and her a horse (it's a bay male) and I think I might rename him Frankel. ARE THERE ANY OTHER GOOD BAY GELDING NAMES??? I love it because it is strong and silent. I love the name Joey because it is the name of the horse from War Horse! I love War Horse the movie and thought it was a good name for horses that look a lot like Joey. Hi. Here are some Breyer horse names for your Breyer horses or horse. Valentine, pumpkin, seabiscuit, teddy,cookie and cream, oreo, bumblebee, Chester, mystery, cast pure, sweetie, Hercules, shadow, jasper, misty, cookie, spirit, cupcake, midnight, secretariat, honey, rain, bandit, and buddy. I think Shadowfax for a white horse because if any of you watched Lord of the Rings, it is the name of the white horse lord of all horses. I like the name Shadowfax because it is a great name and not very common. Shadowfax is the name I would name a white horse if I got one. I love the name Thowra. If any of you horse lovers have seen the movie 'The Silver Stallion' and love palominos, then this is the name for you. I named my horse Thowra which means wind. It's a beautiful name and would suit any horse, especially palominos. Magic is a good name because I think horses are Magical and they are the best creatures! It sounds magical especially for a dapple grey. Some famous horse names from real life and books! A brilliant Australian horse who had the X factor, an enlarged heart. His name means 'lightning' in Thai and he ran like it. Some horse names that I really like are the horses from Bonanza the buckskin Buck, then there is Sport, Chub the Black, and Little Joe's horse Cochise. Then later in the series Sport and the actor with him left then a new character came which was Candy. Now they never named the horse, but I feel a good name would be Lady if it was a mare, and Bullet if it was a stallion. A name made famous by a race horse legend. I love this name because it has some color in it. It is well fitted for a big horse (black,red or brown with a blaze which is also my dream horse). I love these horse names: DANCER, CHALLENGER, CLASSY, BREEZE, and JADE. Those are my favorite horse names. I like the name Fabio because it would be such a cute name for a cute little fat pony such as a haflinger. This is the name of the horse that won the 2014 Kentucky Derby and the Sanita Anta. He's an underdog and a great story to read about! I have a pony named Silver and he is the best! He is so pretty so I think it is the best name in the world for a white pony/horse. Smokey can be used for a dark or black horse and it could be used for a small to large horse. It is my horse's name. I like the name Pumpkin. It's the perfect name for the smallest horse in the world. It's the name of the horse of my dreams. It gives the idea of fierceness, power, and strength. I think Seabiscuit is a great name!! The movie is amazing too!! Well the name Cole Turner is from the Charmed show & the real Cole Turner is my distant cousin to the US President John Tyler.